What does it take to transform a good looking car into an amazing piece of fiery carbon fiber goodness? Well, for starters, it takes tons of carbon fiber (a given), a red exterior paint job, and an engine update fit for a street king. 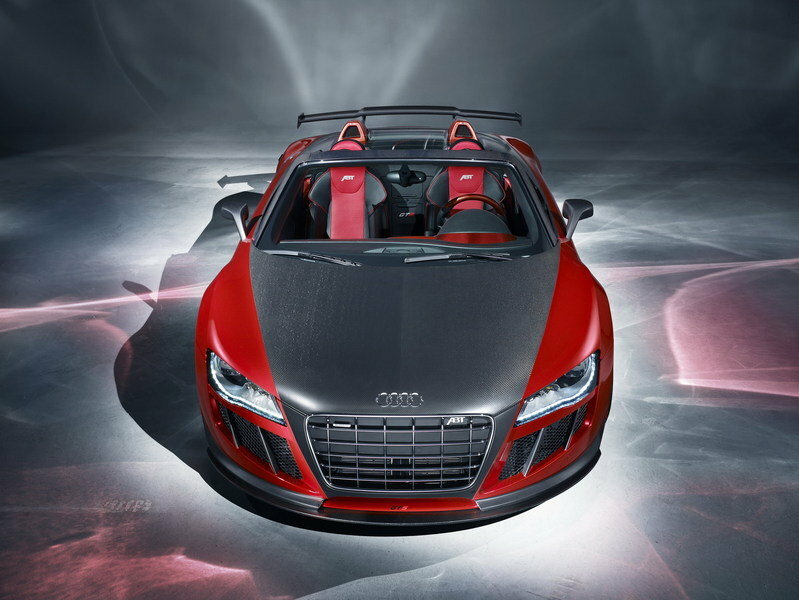 Potential suitor, meet your mate in the Audi R8 Spyder made over by ABT Sportsline. Their package, called the R8 GT S, made its world debut at the 2011 Geneva Motor Show and instantly grabbed hold of our hearts. For this project, ABT took the standard V10 engine and updated its output to an impressive 620 HP, up from the standard 525 HP. The result is a 0 to 60 mph sprint time of just 3.6 seconds and a top speed of 198 mph. But the most impressive feature for the new R8 GT S is its exterior and interior look. ABT has chosen to dress up the Audi R8 in full carbon fiber garbs, from the bonnet to the rear wing, and then doused it with a sleek red paint finish. The same treatment has also been applied in the interior. 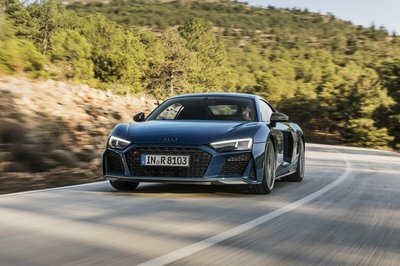 Hit the jump to read more about the ABT R8 GT S.
We like...no scratch that...We love the Audi R8 Spyder and we’re guessing most people feel the same way. Now add the most impressive tuning package ever offered for the Spyder R8 and it’s an instant match made in heaven. ABT Sportsline uses carbon fiber from the bonnet all the way to the rear wing, including carbon fiber goodness at the front skirt, rear skirt, windscreen frame cover, red air scoops, engine bonnet, and exterior mirrors. The car sits on new light metal alloy ABT BR in 20 or CR Superlight in 19". For the interior, the R8 GT S continues the same exterior treatment: the center console, the shifting gate, and parts of the door panels are covered in red carbon, while the remaining parts of the doors and the dashboard were covered with new leather. The sports seats are covered in red and black leather. 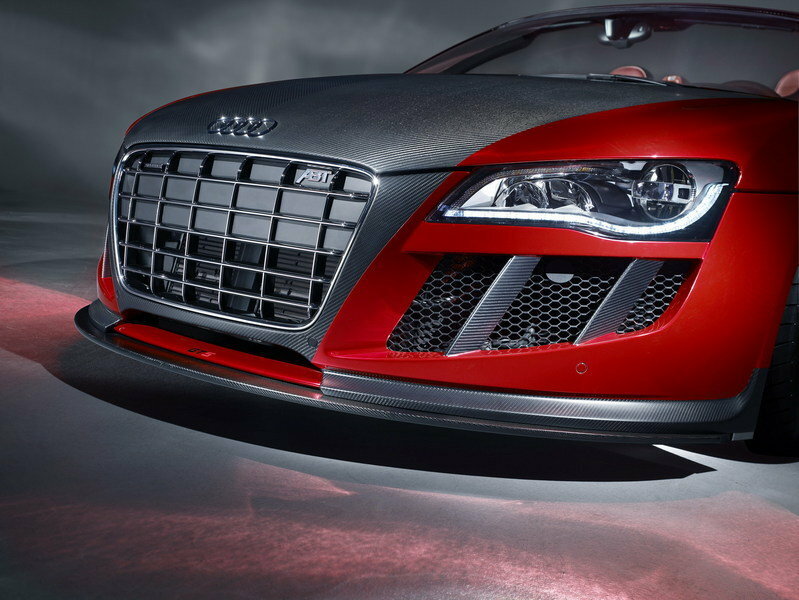 In its standard version, the Audi R8 Spyder is powered by a V10 engine that delivers a total of 525 Hp. Impressive, but it’s just not enough and ABT Sportsline concurs. Their package includes new ABT Power technology and a new exhaust system that increases the total output to 620 HP. 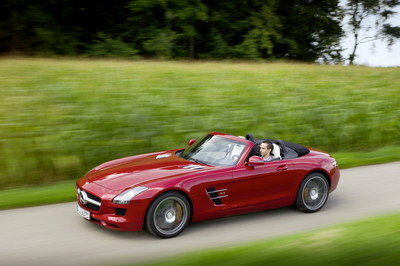 As a result, the sprint from 0 to 60 mph is made in 3.6 seconds while top speed goes up to 198 mph. The German tuner has yet to provide any details as far as pricing for this perfect vehicular specimen. However, if anyone loves this package for the Audi R8 as much as we do, then its price will not even come close to mattering. This isn’t Abt Sportsline’s first trip around the block with the R8 Spyder. Last year, they released a nice little tuning package that increased the total output to 600 HP. Their previous package delivered the same performance numbers as the R8 GT S: 0 to 60 mph in 3.8 seconds and a top speed of 198 mph, but wasn’t as good looking as the GT S.
However, the most impressive engine update for the R8 Spyder comes from STaSIS Engineering. Their update package delivers an impressive 710 hp and 523 lb-ft of torque. The added power is downright wonderful, but the look of the ABT GT S is perfect, bar none. I want to have it now. It looks so cool. The paint that used was good. The red and metallic silver was just right to be applied on the exterior. From that paint finishing, the exterior looks awesome and sporty. I wish I could have a miniature of this car. The combination of the color of the interior of the car is great. The performance of this car is great and the engine sound is good. With wide body of the car, I think this car is the heavy height than the other car. I’m impressed with the angst that this car had most especially on the headlights of this and 620 horsepower is kind of impressive already. I have to agree that it is absolutely looks great on both exterior and interior of this ABT R8 GT S. However, if I’m going to compare this to its competitor, I can say that I would still prefer to have the aggressiveness of this one. 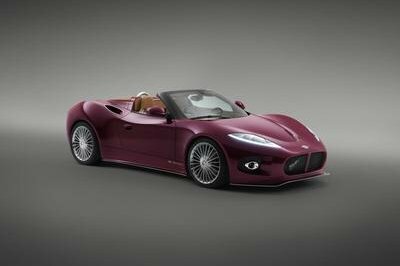 One of the rare concept not just on the color choice but the hot and aggressive gesture made on this car. 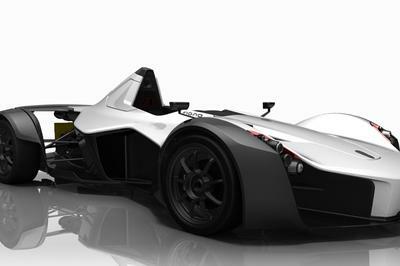 Definitely it has one of the outstanding design concept and very ideal as sports car. Well, I’m still prepared the old and original ABT R8 GT S but I’m impressed with the angst that this car had most especially on the headlights of this and 620 horsepower is kind of impressive already. It’s ugly on its exterior design except only on its headlights, but I’m impressed with the interior touch. It really suited on it, and 620 horsepower is quite impressive for a convertible car. I don’t know what to say on this R8 GT S, hmmm the update exterior style is kind of impressive. The black and red theme looks good on it even on its interior. I can say that it will surely can catch lots of attention. The red and black theme look so sporty and aggressive plus the power output is quite an impressive engine update. And also I love the styling on its interior its very awesome. Impressive! The speed performance of the car is quite great. However, it seems that the styling in the exterior is bloat loaded. Audi have added too many spoiler on the car. BTW, the interior is made of an luxurious material. it looks like an hot wheel. thats not cool. This one is definitely a nice work on the R8 Spyder. The carbon fiber parts are actually a perfect match for all the other pieces here. And they also did a good job of working up the engine. Looks like a toy car to me. But its features are rather impressive, and the carbon fiber parts made it look even cooler. They really found a way to make good use of an R8. I can’t see why you think that this is ugly. Sportsline made a beautiful R8, and no one(beside from you) can deny it. The bodykit and the paint is amazing, along with the interrior. You must be crazy if you think that this is an ugly car! It`s UGLYYY!!! OMG, they`ve ruined the R8! It was one of the most beautifull cars in the intire world and those idiots did what i thought it was impossible.